Trouble down at Healthwatch Leeds, the organisation set up earlier this year to be the independent voice of us citizens/patients/consumers when it comes to everything about health and care services in Leeds. Director Janet Somers is leaving the organisation after just six months in the job, it was announced yesterday. Appointed controversially in May, former Leeds City Council employee Ms Somers is leaving less than two weeks after the organisation’s vice-chair resigned unhappily half way through her one year term. To paraphrase Lady Bracknell: to lose one leader may be regarded as a misfortune; to lose two looks like carelessness – or worse. No reason was given for Ms Somers’ departure. And no mention has been made on the Healthwatch website of the Vice-chair’s resignation. Does that lack of transparency matter? 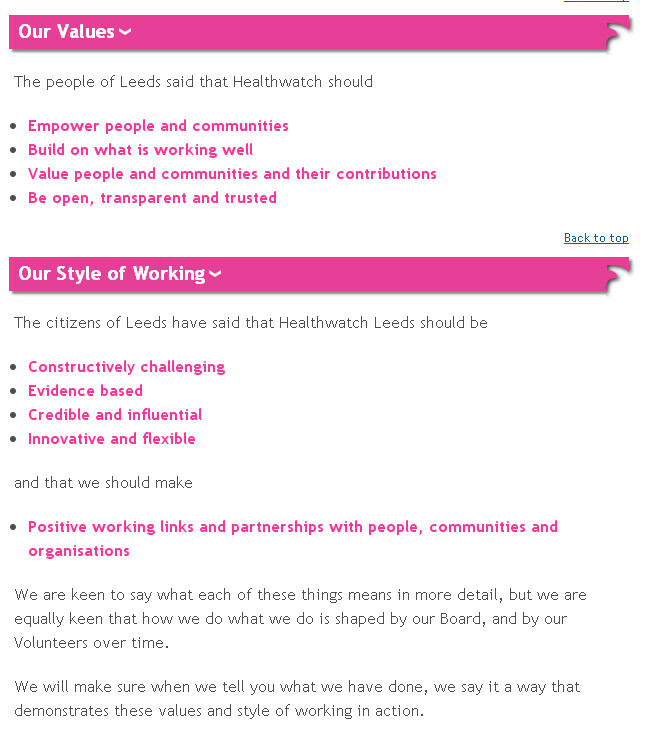 Why should anyone care if Healthwatch Leeds turns out to be another of those organisations that operate in our name, promising to be “open, transparent and trusted” … and then scramble for a brush and a carpet when things go pear-shaped? You know the ones. They’re “community-led” and “values-based” and have more “vision” than Specsavers … but no-one really knows what they do – let alone whether they’re any good at it. 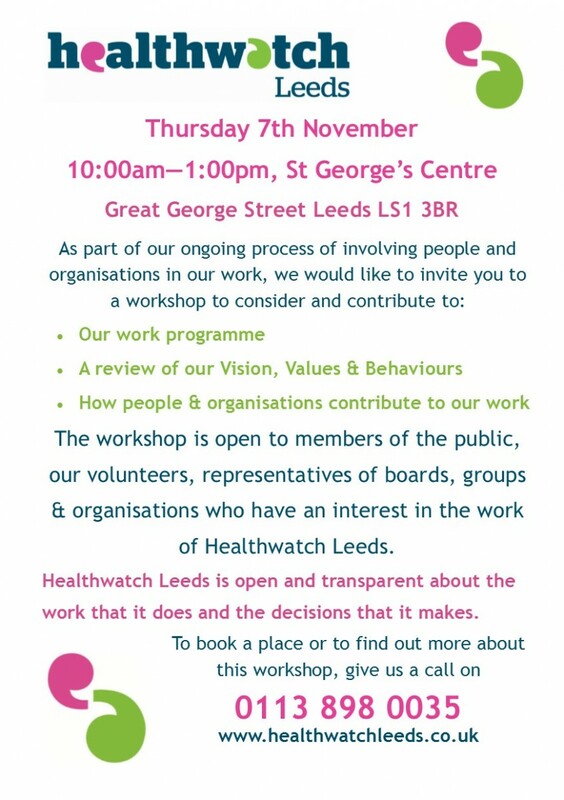 So the people responsible for Healthwatch Leeds – the remaining management, the organisation’s funders, the consortium that’s responsible for its performance – shouldn’t worry too much as they prepare to have a second bash at appointing an independent director. Hardly anyone’s watching. And those that are don’t really expect open and transparent. Three wise monkeys … and we’ll have forgotten all about it by next week … apart from a compassionate nod in the direction of the organisation’s workers and volunteers. I wonder what it’s like to work there? This entry was posted in Uncategorized and tagged healthwatch leeds, janet somers, leeds, leeds city council. Bookmark the permalink. Thanks for covering this story. I’m the ex-Vice-Chair mentioned in your story, above. I wanted to get involved with HWL because of my commitment to Leeds health and social care services, and because I believed that this new organisation would be a chance to do things differently. I believed it was a real chance to hear some different views, and to offer real challenges to health and care organisations at a time when it is desperately needed. HWL have a statutory position on the local Health and Well-being Board. I would be interested to know how many HWL Volunteers have had the opportunity and support to attend the HWBB monthly meetings? Did they have the opportunity to provide evidence for HWBB to consider, either as individual stories or through intelligent use of data? How well were decisions made by the HWBB communicated to the volunteers at HWL, or indeed to the citizens of Leeds via HWL? What evidence of impact from HWL can we see recorded in documentation of HWBB decisions? HWL Governance is currently provided by a Board entirely appointed by the (ex-) Director and Chair: the polar opposite to the Governance arrangements detailed in the tender documents that the HWL contract was awarded on. We need to see a citizen-led Board consisting of people who find it harder to be heard in the system: not a Board of the “usual suspects”, who are already found, or have history on, the Boards of the organisations HWL are supposed to challenge. This Board was supposed to be in place by September 2013, which was then put back to Christmas 2013. There’s a real danger that there will be no Inclusive Board for the first year of operations. It is critical that HWL re-focus on their commissioned priority as an Inclusion organisation, developing the assets represented by the volunteers. HWL must prioritise the appointment of an Inclusive Board, and everyone involved should be judged against this key deliverable by commissioners and consortia partners, and by the wider public. Then, and only then, we might see HWL have some real impact on the local HWBB, and the wider system in health and social care. There’s a lot of work to be done, and it has to be done quickly, if HWL is to retain any credibility. So sad that HWLeeds were unable to provide the support and adaptations needed to include disabled people in its operations. Hopefully they can learn from their mistakes and really look at how they empower citizens who use health and care services. Saying that I am not sure the funding of local HW is adequate to really engage with certain communities. I say this as a wheelchair user and as an experienced community involvement worker with a whole range of different impairment groups and third sector orgs. As I am a former Leeds Link and before that the PPI Forum volunteer people may say that I am bias and wanted Leeds Healthwatch to fail but I can assure you that I only wish to give the people of Leeds the most open. Inclusive and democratic organization the will monitor and help to improve the health and social care in Leeds. I did volunteer for LHW but have not felt able to become more active because of the structure of LHW which could never have been said to be inclusive or democratic. 1. The board is appointed by the chair and the director who are both employed by LHW, I have raised this with the chair who has said that she is not employed by LHW but as she receives a salary from LHW I would argue that she is an employee of LHW. 2. After I looked at the LHW budget and realized that the total that had been set aside for volunteers out of pocket expenses would be totally inadequate. This stops the disabled and people on low incomes from volunteering as the highest costs for volunteers is for transport and PA assistance to attend meetings. I still wish to help LHW to become the true champion of the people of Leeds but I am sorry to say that I can’t under the present structure. I agree with your concerns about the current, entirely appointed Shadow Board. Intended as a temporary measure to provide necessary Governance to the organisation ahead of the Inclusive Board being recruited, it is a real concern that in December, we still have no news about how or when this Board will be in place. The plan was originally to have this Board in place by July. This was put back to September, then put back to December. It’s really important that our communities in Leeds continue to put pressure on the organisation to ensure this is the number 1 priority for HWL. Until it is in place, I fear our concerns about the inclusive nature of the organisation remain. Help to attend meetings with travel expenses and personal assistance is core business for an inclusion organisation, not an optional extra. We have to keep the pressure on to ensure HWL does not become an organisation only for people who have no additional needs. I hope that the commissioners of the HWL contract will be ensuring that they meet the brief they were contracted to deliver, on the timescales agreed at tender.